San Diego, Calif., Nov. 5 — T.C Kline Racing’s Neal Sapp went into today’s Speedvision World Challenge Touring Car series season finale with an outside chance of taking the championship, trailing points leader Pierre Kleinubing 227-209. His only hope was to win the race, which would be his first in the series, and pray for Kleinubing to have terminal problems. Sapp did his part, taking his first series victory in his No. 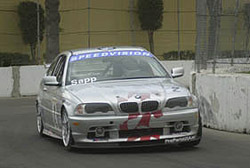 2 WebSite.ws/TCKlineRacing.com/ProParts BMW 328ci, but Kleinubing failed to cooperate, finishing third and clinching his second series championship. Kleinubing, driving the No. 42 BuySellorHold.com/RealTime Racing Acura Integra R, started on pole, with teammate Hugh Plumb alongside. Sapp, who clinched the series’ Rookie of the Year award at the previous round at Las Vegas, got a great holeshot on the standing start from third on the grid, and split the two Acuras into the first turn. Sapp led the first seven laps, but pegged the rev limiter in Turn 4 on the eighth lap, causing the engine to shut off and allowing Plumb and Kleinubing to get past. Sapp refired the engine and set off in pursuit, the superior brakes of his BMW helping him to pass second-placed Kleinubing on Lap 13 and leader Plumb on the following circuit. From there, Sapp was able to hold the Acuras off to score a 1.409sec margin of victory to claim his first series victory. Sapp was disappointed not to have won the championship, but gracious in defeat. "Pierre has done a great job all year," he said. "I knew we’d have a tough time winning the championship, and he did what he needed to do. "At the start, Hugh and Pierre left me enough room to get in between them. It’s a street circuit, and there’s not much room out there, so we all touched a little, but made it through. When the car shut off, I thought that was it. I flicked the switch a couple times and it came back on. It’s from a glitch in the system. Whenever I get in the rev limiter real hard, it shuts off. I thought I threw the win away." For Plumb, his runner-up finish was his third podium result in as many races. "At the start, I played it a little conservative," he conceded. "When Neal had his problem, I got into the back of him because he slowed suddenly. After that, I saw him coming up pretty fast and I knew that my lead wasn’t going to last long. I’m happy with second, happy for my teammate Pierre, and happy for Neal getting his first win." Kleinubing, who only needed a 12th-place finish to clinch, was ecstatic to back up his original series title from 1997, but acknowledged that it was far from a worry-free affair. "Neal was coming over on me at the start and I though he was gonna put me into the wall," he said. "I actually braked on the straightaway and found my place to pull into line. After that, I just played it smart. At one point, I got up to second. We had a car capable of winning today, and certainly one capable of 12th. I really have to thank the RealTime Racing crew and [team owner] Peter Cunningham for helping to win this championship." Alfred duPont finished fourth, with Kevin Schrantz filling out the top five in the third RealTime Acura. Roger Foo did a great job to finish sixth in his seven-year-old Honda Civic Si after starting from 16th, and won the Borla Performance Award for the drive of the day for his efforts. Don Salama, Shauna Marinus, Paul Alderman and Steve Pfeffer rounded out the top 10. Site produced by Racer Communications, Inc.